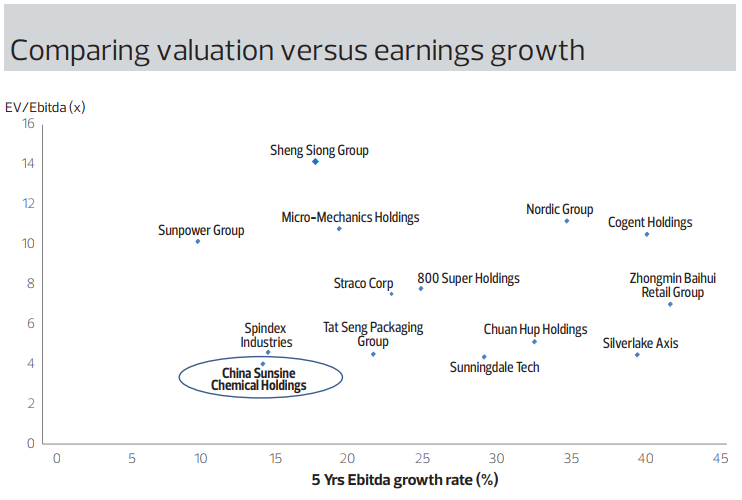 SINGAPORE (Feb 5): China Sunsine Chemical Holdings has been one of our portfolio’s top-performing stocks, gaining 20.8% since we bought it just two weeks ago, thanks in part to a growing number of brokers who have since started covering the company. This vindicates our top-down, bottom-up approach to finding undervalued stocks. The stock first appeared on our radar when we performed our routine filtering, using the Fundamental and Valuation scores from absolutelystocks.com. 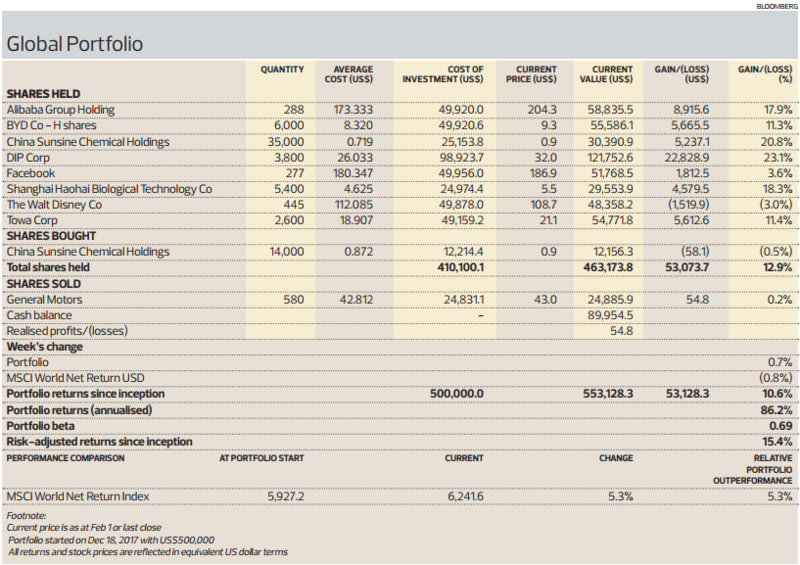 China Sunsine has a Fundamental score of 2.8 out of 3 and Valuation score of 1.8 out of 3. We also looked closely at sales and earnings before interest, taxes, depreciation and amortisation growth over a period of time and, importantly, the quality of growth — that is, consistency — on a year-to-year basis. Please see chart, which shows where stocks are positioned relative to EV/Ebitda and Ebitda growth. We were invited to meet the company last week and after the meeting, we remain comfortable with our investment, despite the share price rally. Valuations are still inexpensive and, more importantly, China Sunsine has a sound business model, a leading global market positioning and an experienced management team that has led the company for 40 years. It is also in a sweet spot as China’s ongoing environmental crackdown is consolidating the industry in favour of bigger and better players. We like China Sunsine for its leading position in the global market for car tyre rubber additives. It is the world’s largest producer of rubber accelerators, with an estimated 18% global market share and a 31% market share in China. It supplies to more than 1,000 customers, including two-thirds of the world’s top 75 tyre makers, the likes of Bridgestone, Michelin and Goodyear Tire & Rubber Co. The company has a strong competitive advantage, stable customer base and scalable production capacity. It also provides a cheaper — and more stable — exposure to the global car industry, without cyclical, product or brand uncertainties. In particular, electric cars, boosted by falling production costs and regulatory demands, will further boost long-term sales for car tyres while the tyre replacement market provides recurring demand. Investors have in the past been sceptical — perhaps rightly so — of China-based companies listed on the Singapore Exchange and Bursa Malaysia. Admittedly, we are too. But we are also fact-based and data-driven. China Sunsine has been listed on the SGX since 2007 and has a consistently profitable track record. Its chairman, Xu Cheng Qiu, has run the company since it began operations in 1977 and owns a 63% stake. We were made to understand that this is his core business, and there are no related-party transactions in the company’s operations. A succession plan is already in place. China Sunsine is a leading speciality chemical producer of rubber additives, such as accelerators; antioxidant, vulcanising agents; and -anti-scorching agents. These are chemicals used in the production of rubber-based products and are mostly sold to tyre makers serving the automobile sector. Its production facilities are located in China, within Shanxian, Weifang and Dingtao. In 2016, 71% of sales were from rubber accelerators, 9% from insoluble sulphur and 20% from antioxidants and others. Capacity for the company’s range of products was expanded by 20,000 tonnes, or 13%, from 152,000 to 172,000 tonnes, in 4Q2017. Commercial production is expected to start in 1H2018, pending government approval. It is already operating at full capacity for rubber accelerators and insoluble sulphur, and 67% for antioxidants. China Sunsine’s outlook is tied to the rubber tyre sector, which has seen strong sustainable growth from tyres for new cars, as well as the tyre replacement market for existing cars. China’s rubber tyre production grew by a compound annual growth rate (CAGR) of 6.8% from 2009 to 2016. The global automobile market grew 4.8% in 2016 and is estimated to have slowed to 2.4% in 2017. However, the sector will enter a new leg of major expansion in the coming decade with the replacement of petrol- and diesel-fuelled cars with electric cars. This structural change is being driven by a combination of economic, environmental and regulatory factors. R&D and mass production are leading to rapid battery cost declines and longer battery life, narrowing the cost competitiveness gap between electric vehicles and internal combustion engines. Global sales of electric cars in 2016 totalled 750,000 cars, with a stock of two million cars on the road worldwide. In a May 2017 report, the International Energy Agency forecast the stock of electric cars to grow from two million in 2016 to between nine million and 20 million by 2020 and between 40 million and 70 million by 2025. Since then, several governments have mandated deadlines for a ban on -petroleum-fuelled cars, to be replaced by zero-emission electric cars, such as Norway (2025) and the UK and France (both 2040). Notwithstanding the longer-term substitution impact of electric cars, China’s car ownership is still low at 111 cars per 1,000 persons, compared with 825 cars per 1,000 persons in the US in 2016. The global tyre replacement market represents 65% of total tyre demand. It is also sufficiently large to offset any potential cyclical slowdown in new car sales, especially if car buyers decide to wait for new electric car models in the near term. Meanwhile, China Sunsine has also benefited from an industry consolidation following ongoing structural and regulatory-led changes. The Chinese government’s crackdown on subpar rubber-producing factories has eliminated weaker competitors and benefited bigger and better ones like China Sunsine that uphold strict environmental protection standards, with high compliance on wastewater treatment and sulphur recycling standards. Since 2011, China Sunsine’s sales have grown by a CAGR of 12% and net income by 17%, driven by better sales and margins. For 2016, the company posted net profit of RMB221.7 million ($45.9 million) on sales of RMB2.04 billion. For the nine months to September 2017, it had almost achieved 2016’s full-year numbers, with net profit of RMB209.3 million on sales of RMB1.87 billion. The pivotal year was 2014 when profits surged 2.8 times, as China took action against rubber accelerator producers that failed to comply with strict environmental standards. Ebitda margins improved from 12% in 2013 to 20% in 2014, and have stayed fairly consistent since then. China Sunsine enjoys relatively good pricing power, owing to its leading global position. Moreover, rubber accelerators make up just 3% of a rubber tyre’s total costs. Thus, it is not a major or price-sensitive component for tyre manufacturers, who are more concerned with quality, consistency and environmental standards for their input materials. The company has been debt-free since 2015, and had net cash of RMB462.7 million as at September 2017, equivalent to 17% of market capitalisation. It has a 20% dividend payout policy, with expected yield of around 2%. While the company can afford to increase its payouts, we believe it will prefer to be conservative to build up reserves for future expansion. The stock’s valuations are undemanding at 9.64 times trailing 12-month earnings and 1.65 times book. For China-based producers of rubber accelerators, China Sunsine leads with a capacity of 97,000 tonnes, followed by unlisted Kemai Chemical Co with 51,000 tonnes and Shenzhen-listed Shandong Yanggu Huatai Chemical Co with 30,000 tonnes. Interestingly, Shandong Yanggu Huatai trades at 23.17 times trailing earnings and 4.93 times book, despite its total revenues and net profit being only 61% and 71%, respectively, of China Sunsine’s in 2016. Its market capitalisation of RMB4 billion exceeds China Sunsine’s $565 million by 47%, despite being much smaller. Could this be due to the poorer valuation of SGX-listed China companies because of perception issues, as mentioned earlier? Meanwhile, global tyre companies such as Bridgestone and Michelin trade at about 14 times earnings and two times book, on average. This article appeared in Issue 816 (Feb 5) of The Edge Singapore.